It is very often that browser plug-ins are related to search engines and vice versa, so it is of no surprise that All My Web Toolbar comes with a search engine as well. 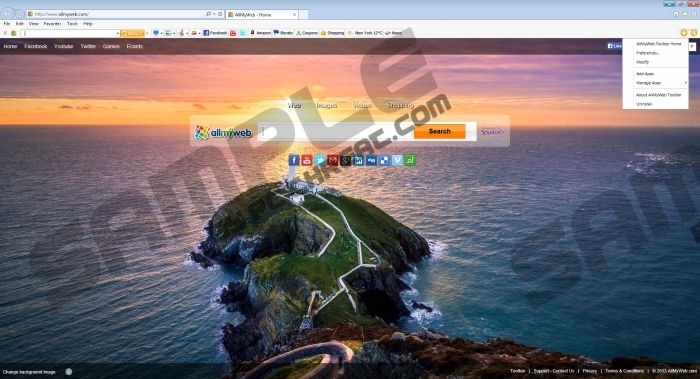 This browser plug-in is created by Visicom Media Inc. and if you install the full version of All My Web Toolbar, you will also have allmyweb.com set as your default homepage and search engine. However, computer security specialists advise against having this application on your computer, so it would be in your best interest to remove All My Web Toolbar from the system. It is important to note that All My Web Toolbar does not enter the system surreptitiously and you are always asked whether you want the application installed. It can obviously be downloaded at the official homepage via allmyweb.com, but it is rather rare for computer users to stumble upon adware and freeware websites while they surf the Internet. It is a lot more likely for you to download All My Web Toolbar bundled with freeware from third party websites. All My Web Toolbar is known to be bundled with various installers from scenicreflection.com. Thus, if you are about to download screensavers, wallpapers and similar things, make sure that you do not install All My Web Toolbar onto your computer as well. Some users may think that All My Web Toolbar is a browser hijacker, because of the browser settings modifications. However, users are informed about the oncoming changes and they can opt out if they read the All My Web Toolbar installation setup carefully. The unfortunate point is that users often go through freeware installation automatically, without stopping to read important setup steps. As a result, they end up with random applications they do not need, and they browser settings changed. It is not recommended to keep either All My Web Toolbar or allmyweb.com onto your computer. Despite the fact that this website looks like it can provide you with decent search results, it still makes use of Yahoo! search engine, and most of the search results that go through allmyweb.com filter are full of advertisements and other suspicious links. The toolbar itself is also suspicious. Our research specialists claim that All My Web Toolbar is the same as ScenicReflections Toolbar, and you can see that when you click to download All My Web Toolbar, it is actually ScenicRelfections Toolbar that gets installed on your browser. Due to such negligence, it is hard to trust the creators of this application, and the application as well. Uninstall All My Web Toolbar from your computer and then make sure your browser settings are restored to default. Run a full system scan with SpyHunter free scanner to check for other potentially unwanted applications and invest in a powerful computer security tool if need be. Go to Settings on Charm bar and click Control Panel. Select Uninstall a program and remove ScenicReflections Toolbar. Access Add or remove programs and uninstall ScenicReflections Toolbar. Press Reset Firefox on a pop-up box. Scroll down and click Reset browser settings button. Quick & tested solution for All My Web Toolbar removal.